Tortilla chips don’t get no respect. Most often bought in bag form and dipped into hot cheese, their potential to form part of a tasty meal is overlooked. 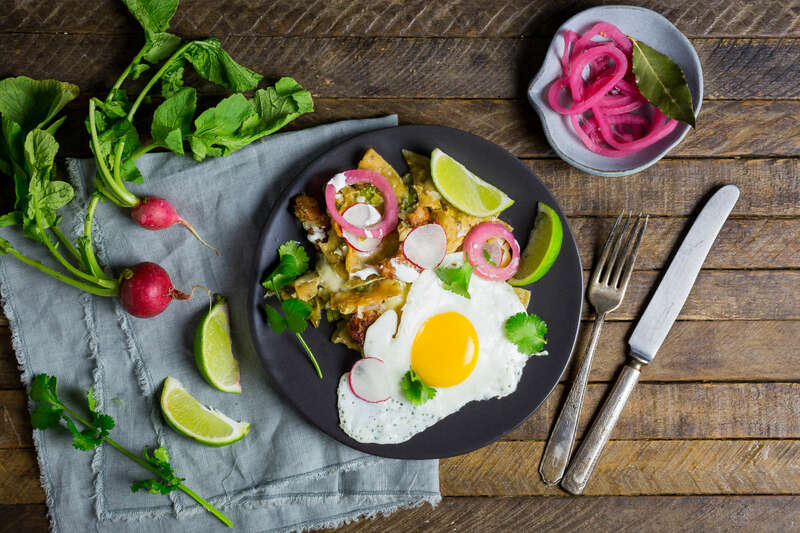 Combine home-made chips, salsa verde, spicy chorizo and eggs, serve up with fresh radishes and vinegary pickled onions, and you have yourself a chilaquiles dish that’ll make you think twice the next time you’re tempted in the snack aisle. Note: This recipe is part of our ongoing series with Serious Eats. We’ve been fascinated with tomatillos ever since we first grew them in our deck herb garden a few years back. We bought two seedlings from a farm sale, and watched them grow and develop their papery husks, like hanging lanterns, eventually to get filled out by the fruit within them. Unfortunately, one plant was unceremoniously trampled by a backyard chicken, so we didn’t get quite the yield we would have liked – but fortunately, pollination had already taken place (tomatillos, unlike tomato plants, cannot self-pollinate, so you’ll need more than one to grow fruit). We had enough to make ourselves a really tasty salsa verde – the green cousin of a tomato salsa. 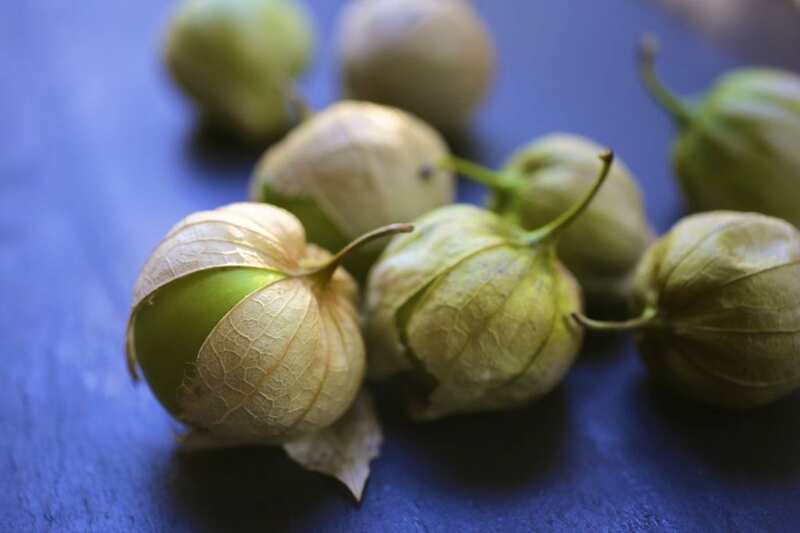 Tomatillos share the same growing season as tomatoes, so at the beginning of summer we’re still too early for local varieties, let alone in our backyard, but that doesn’t mean you can’t find them at the grocery store. Salsa verde is packed with tomatillos, chilis, and love-it-or-hate-it cilantro (guess which way we go? ), and you can add as little or as much heat as you like by varying the variety and amount of hot chili peppers. We usually opt for jalapeños, but if you want a little more fire you can look for serrano peppers. 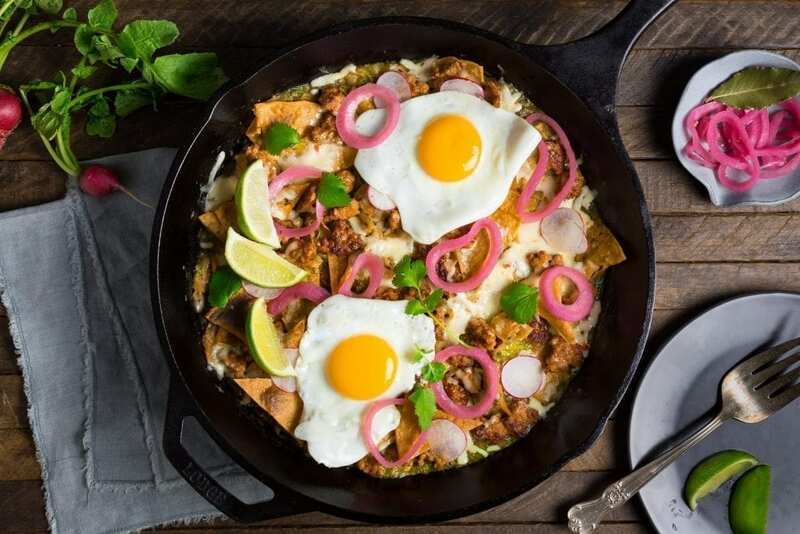 This time, we decided to use the sauce, not as a dip, but as a base for chilaquiles – a Mexican dish combining freshly-made tortilla chips with salsa and toppings – kind of like nachos, but saucier and paired with eggs. While you can certainly buy jarred salsa verde, it’s incredibly quick and easy to whip up at home, and that means you can make it exactly how you like it. The ingredients can be simmered or roasted, either way takes just a few minutes, and then after a quick whir in a blender, your salsa is good to go. You can even make it up to two weeks ahead, if you like. The key to chilaquiles is homemade tortilla chips. The packaged variety are great for nachos, but they dissolve too easily in the much wetter chilaquiles environment. To us, one of the best parts of the dish is the crunchy bits that poke up out of the sauce, and that won’t happen if your chips are completely soggy. In fact, we’re so obsessed with those crunchy bits that we hold off on adding some of the chips until the very end of the cooking process which gives these chilaquiles a fantastic variety of textures, from soft and yielding to super crunchy. Luckily, you can find fresh corn tortillas at most grocery stores these days – and frying them up is quick work. We found that just an inch or so of vegetable oil in a Dutch oven was deep enough to get the chips cooked perfectly, as long as we worked in batches. You could use a deep fryer of course, but it’s not at all necessary. Don’t forget to sprinkle a little kosher salt over the chips as soon as they’re out of the oil or else the salt won’t stick. Once the chips are fried, you can set them aside while you prepare the other ingredients. 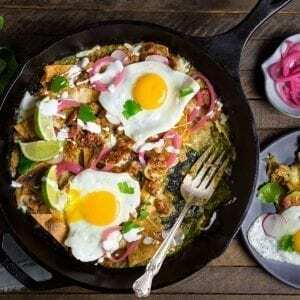 Extra Crispy Chilaquiles with Salsa Verde, Chorizo and Egg. We love to serve it with tart Quick-Pickled Red Onions. For the chorizo, you’ll want to find the fresh (uncooked) Mexican variety. Unlike Spanish chorizo, which is cured and can be eaten like salami, Mexican chorizo is raw. It’s often sold in links but you’ll want to remove it from the casing. Brown the crumbled pieces in a large oven-proof pan (we like to use cast iron for this), then remove the chorizo to drain on a paper towel, and remove most of the oil (save one tablespoon) from the pan. Add the salsa and stock, bring to a simmer, pour in three quarters of the chips and toss carefully to coat them. Remove from the heat and set aside. Make your eggs however you like them (we like fried sunny side up), then add the remaining ingredients – toss in the remaining chips and scatter over the chorizo and the cheese. At this point, because we used jack cheese, we like to toss the pan under the broiler for just a minute or two to melt the cheese and brown the bits of tortillas poking up from the sauce. If you’re using queso fresco (a more traditional choice, but one that doesn’t melt), you can skip this step. Then top the chilaquiles with the eggs, some crisp sliced radishes, a few pickled red onions, a drizzle of crema, some slices of lime for squeezing. 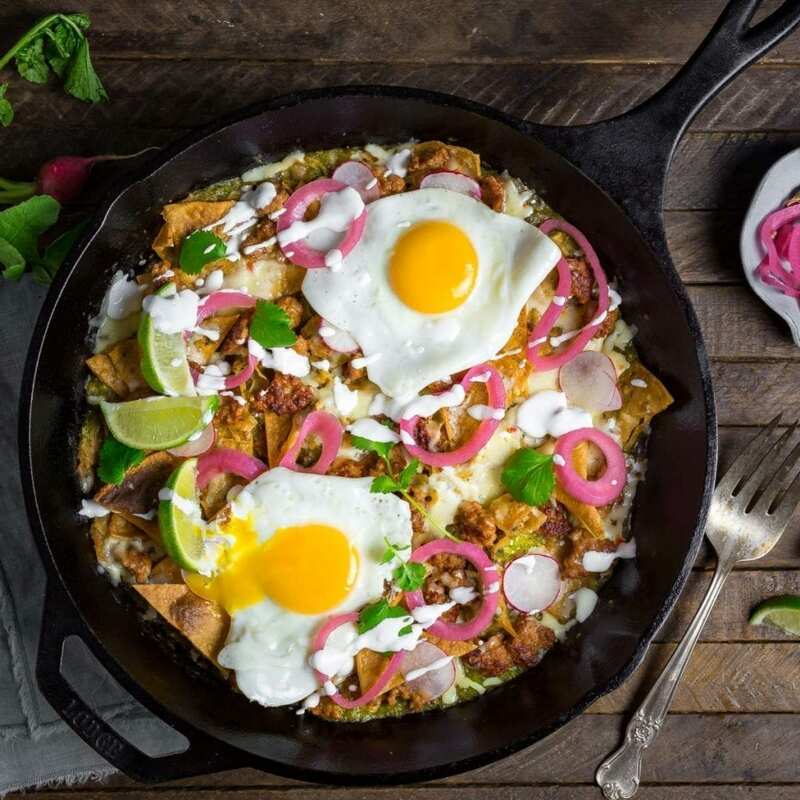 We like to bring the whole bubbling hot chilaquiles pan to the table so everyone can serve themselves. This is the kind of casual food we love best. It’s humble cooking, but nonetheless delicious when done well. And who wouldn’t be psyched to see this on the breakfast table? Heat 3 inches of vegetable oil to 375°F in a in a large Dutch oven, wok or deep fryer. Adjust flame to maintain temperature. Line a large rimmed baking sheet with paper towels. Fry ¼ of tortilla wedges, using a metal spider to agitate and turn them as they cook. Cook until bubbling slows to a trickle, chips are pale golden brown, and are very crisp, about 3 minutes. Transfer to the baking sheet and immediately season with kosher salt. Repeat with remaining batches. Preheat broiler to high heat and set an oven rack 6 or 7 inches from flame. Heat 1 tablespoon oil in a large (12-inch) straight-sided sauté pan or cast iron skillet, set over medium-high heat. Add chorizo and cook, crumbling with a wooden spoon, until brown and cooked through. Remove to a plate and set aside. Remove excess oil, leaving 1 tablespoon. Add salsa verde and chicken broth and heat over medium heat until simmering. Add ¾ of the chips and toss to coat. Cover and set aside while you make the eggs. Stir in the remaining tortilla chips to the chilaquiles pan and season to taste with salt if necessary. Sprinkle with cheese and the crumbled chorizo. Broil until cheese is melted (if using jack) and the tops of a few of the tortillas brown, 1 to 3 minutes. Divide onto plates or serve out of the pan. Top each portion with an egg, sour cream, pickled red onions. sliced radishes and cilantro, and serve immediately with lime wedges, for squeezing. If only you could hear the noises my stomach is making right now. These look DELISH! The perfect way to spice up weekend brunch! Very yummy recipe! I like this. Thanks for sharing.